Receptors in the digestive tract “learn” to feel full. For many people, these receptors have learned to feel full on too many kilojoules, and the desire to overeat overrides all other neural signals. These receptors can be “re-programmed” to feel full on smaller portions of food. GNLD’s GR² Control Appetite Reducer uses glucomannan to help create the feeling of fullness, without the kilojoules. 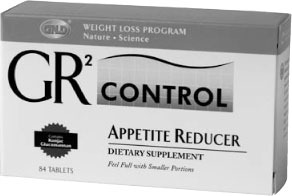 GR² Control Appetite Reducer is a safe, natural alternative to chemical appetite suppressants. Why Fibre to Curb Appetite? Fibre adds “bulk” without adding kilojoules. Naturally occurring fibre absorbs water in the stomach and increases in volume, helping you to feel full faster, naturally. Fibre plays an important role in carbohydrate metabolism by delaying gastric emptying and slowing the release of carbohydrates into the bloodstream, thus helping to minimise insulin response. 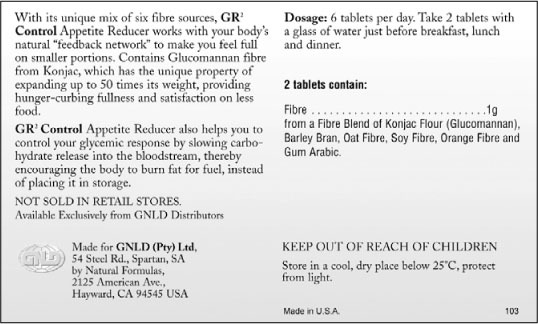 Why GNLD GR² Control Appetite Reducer? Contains glucomannan (Konjac flour) which expands up to 50 times its weight in water, along with five other sources of fibre. Exclusive formula works with your body to create the feeling of fullness on fewer kilojoules. Helps control glycemic response by slowing carbohydrate release into the bloodstream, thereby encouraging the body to burn fat for fuel, instead of placing it in storage. Convenient. Taken before mealtime, two tablets provide hunger-curbing fullness and satisfaction on less food. No added sodium, sugar, or other sweeteners. Zero kilojoules per serving. Unique mix of 6 fibre sources. Includes Konjac flour, a rich source of glucomannan fibre, which can expand up to 50 times its weight, providing hunger-curbing fullness. A natural way to control appetite - An important part of a sensible weight loss plan. Each serving provides 1 gram of dietary fibre and zero kilojoules.